Indonesia is one of the countries that have extraordinary natural resources. This natural wealth invites very many domestic and international tourists to enjoy all the beauty that Indonesia offers. One of the most frequently visited natural sites in Indonesia is the mountains. One of the mountains that is Mount Bromo which located in East Java. Mount Bromo is famous for its amazingly beautiful sunrise. But to be able to enjoy the beauty of Mount Bromo optimally, one must prepare some equipment to support his journey. For those of you who want to go to Mount Bromo, here are some equipment that you have to prepare so that you have an impressive experience during a trip to Mount Bromo. Mount Bromo is one of the mountains that is high enough to climb and obviously, it has low temperature the higher you climb the mountain. To maximize your comfort and safety during the trip, make sure to use warm clothes or at least long sleeves shirt since the temperature is usually around 5 degree Celsius or lower during or before the sunrise. Also read: These Are What to Prepare to Hike Mount Bromo for The First Time! To go to the mount Bromo and to keep you warm, it is highly recommended to wear socks. It will keep your feet warm and comfortable during your stay to see the beautiful view of Mount Bromo at dawn. 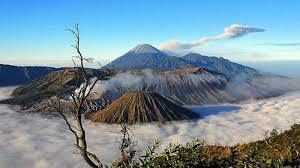 Mount Bromo will surprise you with stunning panoramas during your trip. For that you have to carry a to capture all the moments of beauty that you enjoy up there. Bring a camera with certain specifications (wide lens is recommended) to capture the sunrise moment on Mount Bromo. One of the travel equipment to Bromo that must be brought during the trip is the raincoat since the weather could be unpredictable sometimes. Make sure to bring a raincoat and or umbrella to protect you from the rain. You can also buy raincoat with the latest motifs and models to increase your confidence during the climb near the hiking area. Other attire you might need to protect you from the cold, especially for those who can’t stand being the low temperature for long, is Scarf. Choose a scarf with thick and strong material will also make you more comfortable in enjoying the sunrise on Mount Bromo. We have mentioned long sleeve shirt and scarf, in order to complete the hiking outfit, you would need to wear jacket. A jacket will protect your body and keep your warm. So make sure to wear jacket during your visit to Mount Bromo. To make you successfully conquer Mount Bromo, you are advised to bring trekking shoes that are strong enough to take you from the foot of the mountain to the beautiful place up there. If you are in doubt about the quality of the trekking shoes you are using, you can do additional insoles on your shoes to keep them safe. Make sure you tie the shoelace perfectly and tightly so you would not get tripped during the hike. Protecting your hands from cold weather is also one of the things you can do when you go hiking, especially at Mount Bromo. If you are a person who can stand the cold, wearing simple and stylish glove would be fine but if you are a person who is not a fan of the cold, it is better for you to wear gloves with thicker material, such as gloves that is made from wool. Ginger drink is one drink that keeps you feeling warm in a cold weather. Indonesian are familiar with this drink and they drink it even when they are not hiking. When you want to travel or carry out climbing to various mountains, ginger drink can help you to stay warm. Certainly bringing this drink on your trip on Mount Bromo will help you enjoy the atmosphere there comfortably. If you think that bringing your own drink is such a hassle, you can find this drink near the hiking site. For those who have certain illness or condition, this item is necessary to bring. Make sure you bring your medicine so you won’t get sick during your trip to mount Bromo. Cooking utensils and cooking containers are important things to carry during a trip to Mount Bromo for those who plan to hike to the top and spend some nights on the way up, so bringing cooking utensils complete with food ingredients according to taste is the equipment that you must prepare. Headlamp or flashlight is also an equipment you need to bring to Mount Bromo since there is a chance you can’t see the way during the journey to see the sunrise. Yes for those of you who want to stay at Mount Bromo, make sure you bring a tent with strong materials and adequate capacity. Staying at Mount Bromo will be perfect if you bring complete and strong tents to keep you sleep comfortably. That was 20 equipment for hiking at the Mount Bromo that you need to prepare when going on vacation. Have fun!